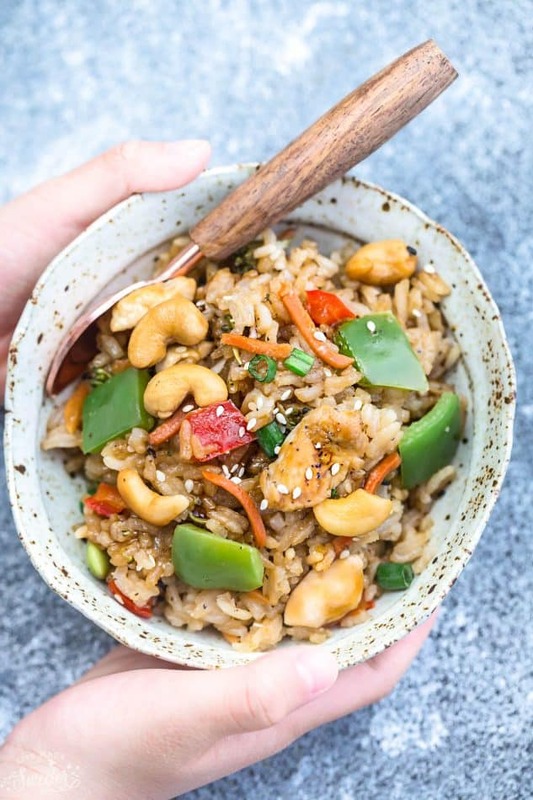 One Pot Cashew Chicken Rice makes the perfect easy weeknight meal. Best of all, everything cooks up in only ONE pan in just 30 minutes. Plus Instant Pot instructions. With back to school starting next week for us, quick and easy meals are going to be happening a lot around here. To help me get through those busy weeknights, I am always relying on lots of skillet, slowcooker and sheet pan meals. There’s just something so satisfying about a delicious meal coming together in just ONE PAN. Dishes are my least favorite chore so having minimal pots and pans to clean up is always a bonus. 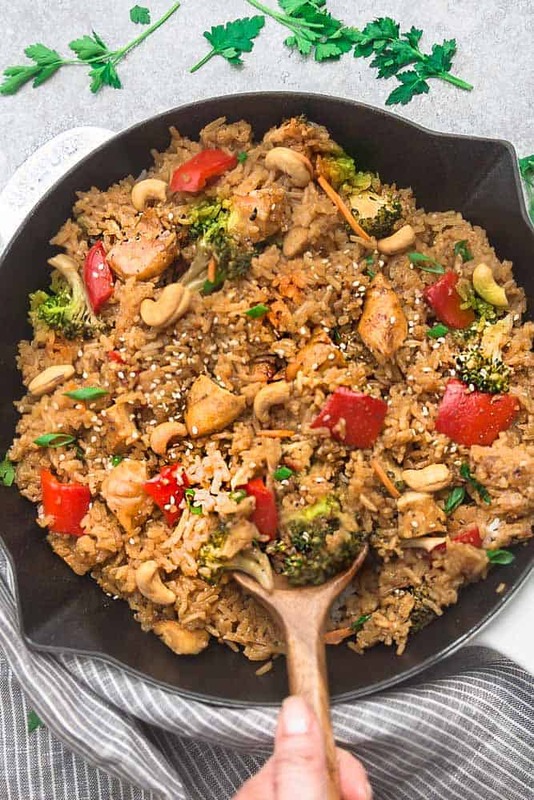 Since this One Pot Teriyaki Rice with Chicken has been such a hit, I thought I would add another one pot spin to my son’s favorite takeout dish. My son loves loves loves cashews and especially Cashew chicken. 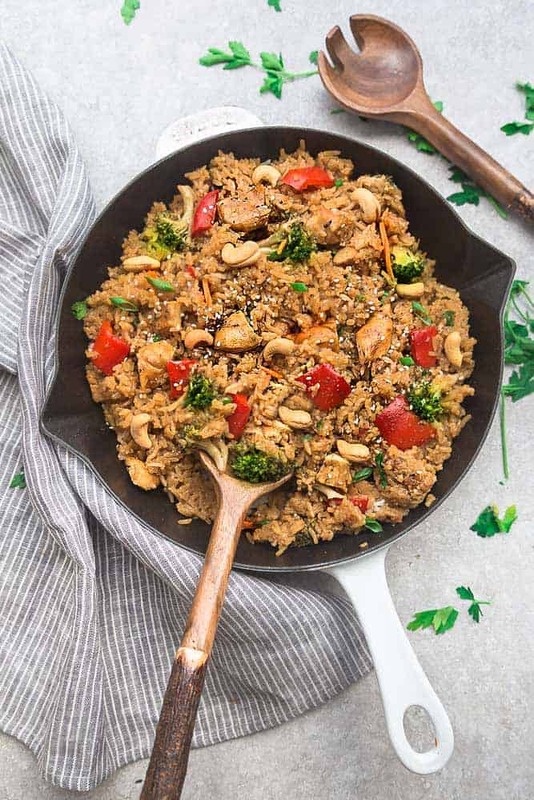 This 3o minute One Pot Cashew Chicken Rice has all those same flavors as his restaurant favorite cooked all in ONE pan – including the rice. This One Pot Cashew Chicken is super easy to customize with your favorite veggies. For this recipe I used carrots, red and green bell peppers. Feel free to add broccoli or anything else you have on hand. Easy, flavorful and perfect for busy weeknights. The best part though? You can make this dish on the stove or in an Instant Pot. Ever since getting an Instant Pot last year, it has been such a lifesaver for those busy weeknights. Use minute rice if you’re short on time – just remember to adjust the covered cooking time to 5-10 minutes, or until the rice is tender. Brown rice works as well but will take longer, about 30 minutes, covered. In a large 12" skillet, whisk together the soy sauce, hoisin sauce, vinegar, honey, sesame oil, and cornstarch. Slowly whisk in the water and place on medium high heat, bringing to a boil until thickened. Add more water as needed to thin out the sauce to desired consistency. Transfer sauce to a heat safe bowl. Wipe down the same pan with a damp cloth, then heat 2 tablespoons of sesame oil over medium-high heat. Add the chicken and season with salt and pepper. Cook for 2-3 minutes, stirring until lightly browned. Add the garlic and ginger, stirring for 20 seconds, or until fragrant. Add the bell peppers and carrots and sauté for another 30 seconds. Stir in 1/4 cup of the sauce, reserving the rest for drizzling at the end. Add the uncooked rice and slowly pour in the water. Bring to a simmer, then lower heat to medium and cover pan. Cook for 12-15 minutes, stirring occasionally until most of the liquid is absorbed and rice is tender. Open the lid and stir in the cashews. Remove from heat and drizzle with the desired amount of sauce to taste and consistency desired (you can save the rest for a stir-fry next time). Serve hot garnished with sesame seeds and green onions if desired. Open the lid of the Instant Pot and press the SAUTE button, allow to preheat for a few minutes until you hear a beep. In a medium bowl, whisk together the soy sauce, hoisin sauce, vinegar, honey, and sesame oil; set aside. Turn the Instant Pot to SAUTE mode. Heat 1 1/2 tablespoons of sesame oil. When the oil is hot, add the chicken and season with salt and pepper. Saute for 2-3 minutes, until lightly brown. Add the garlic and ginger and cook for another 20 seconds. Pour in 1/2 of the sauce, the uncooked rice and the 1 cup of water. Press MANUAL (old model) high pressure or PRESSURE COOK (high) and set for 3 minutes. Once the 3 minutes is up and the Instant Pot beeps, allow the pressure cooker to naturally release for 10 minutes. I love using cashews in dishes they have such great flavour and texture. When do you add in cashews at the end? Hi Kristie, you add them in near the end at Step 6. Hope you enjoy! Written instructions didnt say anything about the hoisin sauce or the sesame oil or even the cashews. Help! Hi Brooke, I just updated my Recipe plugin and it should be fixed now. The hoisin sauce and sesame oil are listed in #1 as well as as #2 (2 tablespoons sesame oil to cook the chicken) and the cashews are at #6. Hope that helps! Hello, thanks for the recipe! I am trying it this weekend. May I ask, roughly what size cubes for the chicken? Thank you! 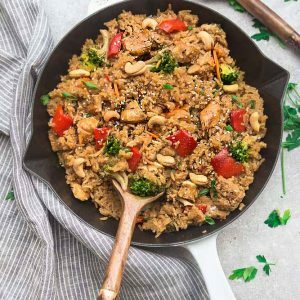 Any suggestions for using brown rice? I followed the recipe just subbing in brown rice, but it was still hard after the 3mins on pressure cook + 10 minute release. Brown rice needs about 20 min ok no the instant pot. I’d only do it with Frozen chicken breasts I planned to shred into the rice after. Hi, I’m wondering if perhaps I’m missing something. When I add the veggies in at the end and cook them on SAUTE mode to soften them, a thick layer of burned rice develops on the bottom of the pot as i’m stirring (no matter how much I stir). is there any way to avoid this, or am I doing something wrong?